Usage: Blend 2-3 tablespoons mix with 2 cups sour cream, or a mixture of sour cream and mayonnaise; or to taste. Allow to refrigerate for at least 15 minutes for flavors to blend. 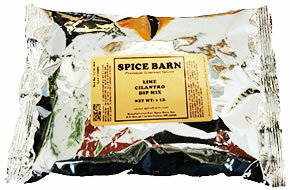 May add additional dried or fresh cilantro, if desired. If you love Southwest flavor, you will love this!